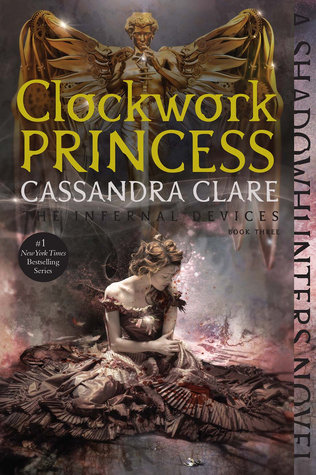 Cassandra Clare is the author of the #1 New York Times and USA TODAY bestselling Lady Midnight, as well as the internationally bestselling Mortal Instruments series and Infernal Devices trilogy. She is the coauthor of The Bane Chronicles with Sarah Rees Brennan and Maureen Johnson and Tales from the Shadowhunter Academy with Sarah Rees Brennan, Maureen Johnson, and Robin Wasserman, as well as The Shadowhunter’s Codex, which she cowrote with her husband, Joshua Lewis. Her books have more than 50 million copies in print worldwide and have been translated into more than thirty-five languages, a feature film, and a TV show, Shadowhunters, currently airing on Freeform. Cassandra lives in western Massachusetts. Visit her at CassandraClare.com. Learn more about the world of the Shadowhunters at Shadowhunters.com. Tessa looked at her reflection in the pier glass in her bedroom. The dress was a deep gold silk, as was the custom for Shadowhunters, who believed white to be the color of mourning, and would not marry in it, despite Queen Victoria herself having set the fashion for doing just that. Duchesse lace edged the tightly fitted bodice and dripped from the sleeves. Tessa had spent many nights doing just that. She was not yet sure where she and Jem would be married, for the Council was still deliberating their situation. But when she imagined the wedding, it was always in a church, with her being marched down the aisle, perhaps on Henry’s arm, looking neither to the left or right but straight ahead at her betrothed, as a proper bride should. Jem would be wearing gear—not the sort one fought in, but specially designed, in the manner of a military uniform, for the occasion: black with bands of gold at the wrists, and gold runes picked out along the collar and placket. He would look so young. They were both so young. Tessa knew it was unusual to marry at seventeen and eighteen, but they were racing a clock. The clock of Jem’s life, before it wound down. “The wardrobe? But—” Tessa broke off with a yelp as Charlotte seized her about the waist and frog-marched her behind the wardrobe like a policeman with a particularly resistant criminal. Released, Tessa dusted off her dress and made a face at Charlotte, and they both peeked around the side of the furniture as the seamstress, after a bewildered look, opened the door. Cecily sighed, and moved her feet. She had known she was out of position; she’d been doing it intentionally, to needle Will. It was easy to needle her brother. That much she remembered about him from when he was twelve years old. Even then daring him to do something, like climb the steeply pitched roof of their manor house, had resulted in the same thing: an angry blue flame in his eyes, a set jaw, and sometimes Will with a broken leg or arm at the end of it. Of course this brother, the nearly adult Will, was not the brother she remembered from her childhood. He had grown both more explosive and more withdrawn. He had all their mother’s beauty, and all their father’s stubbornness—and, she feared, their father’s propensity for vices, though she had guessed that only from whispers among the occupants of the Institute. “Raise your blade,” Will said. His voice was as cool and professional as her governess’s. Cecily was both pleased and a little disappointed to see Will’s eyes spark, just the way her father’s always did when a gentleman’s bet was suggested. Men were so easy to predict. “What sort of a wager?” Will took a step forward. He was wearing gear; Cecily could see the Marks that twined his wrists, the mnemosyne rune on his throat. It had taken her some time to see the Marks as something other than disfiguring, but she was used to them now—as she had grown used to the gear, to the great echoing halls of the Institute, and to its peculiar denizens. “Well, then it should be no great concern to you to make the bet, William.” She used his full name purposefully. She knew it bothered him, coming from her, though when his best friend—no, his parabatai; she had learned since coming to the Institute that these were quite different things—Jem did it, Will seemed to take it as a term of affection. Possibly it was because he still had memories of her toddling after him on chubby legs, calling Will, Will, after him in breathless Welsh. She had never called him “William,” only ever “Will” or his Welsh name, Gwilym. His eyes narrowed, those dark blue eyes the same color as her own. When their mother had said affectionately that Will would be a breaker of hearts when he was grown, Cecily had always looked at her dubiously. Will had been all arms and legs then, skinny and disheveled and always dirty. She could see it now, though, had seen it when she had first walked into the dining room of the Institute and he had stood up in astonishment, and she had thought: That can’t be Will. He had turned those eyes on her, her mother’s eyes, and she had seen the anger in them. He had not been pleased to see her, not at all. And where in her memories there had been a skinny boy with a wild tangle of black hair like a Gypsy’s and leaves in his clothes, there was now this tall, frightening man instead. The words she had wanted to say had dissolved on her tongue, and she had matched him, glare for glare. And so it had been since, Will barely enduring her presence as if she were a stone in his shoe, a constant but minor annoyance. Cecily took a deep breath, raised her chin, and prepared to throw the first knife. Will did not know, would never know, of the hours she had spent in this room, alone, practicing, learning to balance the weight of the knife in her hand, discovering that a good knife throw began from behind the body. She held both arms straight down and drew her right arm back, behind her head, before bringing it, and the weight of her body, forward. The tip of the knife was in line with the target. She released it and snapped her hand back, sucking in a gasp. The knife stuck, point-down in the wall, exactly in the center of the target. “One,” Cecily said, giving Will a superior smile. He looked at her stonily, yanked the knife from the wall, and handed it to her again. Cecily threw it. The second throw, like the first, flew directly to its target and stuck there, vibrating like a mocking finger. “Two,” Cecily said in a sepulchral tone. Will’s jaw set as he took the knife again and presented it to her. She took it with a smile. Confidence was flowing through her veins like new blood. She knew she could do this. She had always been able to climb as high as Will, run as fast, hold her breath as long. . . .
“As if you care about the Law!” Cecily stamped her foot, and was immediately more annoyed than ever; she detested girls who stamped their feet. Cecily recoiled. She had many memories of shouting matches with Will, of the china dolls she had owned that he had broken by dropping them out an attic window, but there was also kindness in her memories—the brother who had bandaged up a cut knee, or retied her hair ribbons when they had come loose. That kindness was absent from the Will who stood before her now. Mam used to cry for the first year or two after Will went; she had said, holding Cecily to her, that the Shadowhunters would “take all the love out of him.” A cold people, she had told Cecily, a people who had forbidden her marriage to her husband. What could he want with them, her Will, her little one? “He began it,” Cecily said, jerking her chin at Will, though she knew it was pointless. Jem, Will’s parabatai, treated her with the distant sweet kindness reserved for the little sisters of one’s friends, but he would always side with Will. Kindly, but firmly, he put Will above everything else in the world. Well, nearly everything. She had been most struck by Jem when she first came to the Institute—he had an unearthly, unusual beauty, with his silvery hair and eyes and delicate features. He looked like a prince in a fairy-tale book, and she might have considered developing an attachment to him, were it not so absolutely clear that he was entirely in love with Tessa Gray. His eyes followed her where she went, and his voice changed when he spoke to her. Cecily had once heard her mother say in amusement that one of their neighbors’ boys looked at a girl as if she were “the only star in the sky” and that was the way Jem looked at Tessa. Cecily didn’t resent it: Tessa was pleasant and kind to her, if a little shy, and with her face always stuck in a book, like Will. If that was the sort of girl Jem wanted, she and he never would have suited—and the longer she remained at the Institute, the more she realized how awkward it would have made things with Will. He was ferociously protective of Jem, and he would have watched her constantly in case she ever distressed or hurt him in any way. No—she was far better out of the whole thing. Jem grinned. “ ‘Demon pox,’ ” he said. Sophie balanced the salver on one hand with the ease of long practice while she rapped on Gideon Lightwood’s door with the other. She heard the sound of a hurried shuffle, and the door swung open. Gideon stood before her in trousers, braces, and a white shirt rolled up to the elbows. His hands were wet, as if he had just run quick fingers through his hair, which was also damp. Her heart took a little leap inside her chest before settling. She forced herself to frown at him. Gideon took a step back to allow her into the room. It was like all the other rooms in the Institute: heavy dark furniture, a great four-poster bed, a wide fireplace, and high windows, which in this case looked down upon the courtyard below. Sophie could feel his gaze on her as she moved across the room to place the salver on the table before the fire. She straightened up and turned to him, her hands folded in front of her apron. Sophie’s hand went involuntarily to her face. She remembered Master Teddy, the son of her old employer, and the horrible way he would catch her in dark corners and press her up against the wall, hands creeping under her bodice, murmuring in her ear that she had better be friendlier to him, if she knew what was good for her. The thought filled her with sickness, even now. Gideon, who had half-raised his hand, let it drop to his side. He looked so woebegone that Sophie’s heart softened. I have everything to lose, and he has nothing to lose, she reminded herself. It was what she told herself late at night, lying in her narrow bed, with the memory of a pair of storm-colored eyes hovering in her mind. “I had thought we were friends,” he said. Gabriel Lightwood leaned against the wall inside the Institute doors, his jacket gone, his shirt and trousers drenched in scarlet. Outside, through the open doors, Tessa could see the Lightwood carriage, with its flame blazon on the side, drawn up at the foot of the steps. Gabriel must have driven it here himself. “He’s coming down. I sent Henry to fetch him, and Cyril to ready the Institute’s carriage. Gabriel, are you injured? Do you need an iratze?” Charlotte sounded as motherly as if this boy had never faced her down from behind Benedict Lightwood’s chair, had never conspired with his father to take the Institute away from her. “Theirs? Who are they?” It was Gideon, hurrying down the stairs, a sword in his right hand. Along with him came Henry, and Jem, and behind him, Will and Cecily. Jem paused on the steps in startlement, and Tessa realized that he had caught sight of her in her wedding dress. His eyes widened, but the others were already pushing by, and he was carried down the steps like a leaf in a current. “Is Father hurt?” Gideon went on, coming to a stop before his brother. “Are you?” He put his hand up and took his brother’s face, his hand cupping Gabriel’s chin and turning it toward him. Though Gabriel was taller, the look of a younger sibling was clear in his face—relief that his brother was there, and a flicker of resentment at his peremptory tone. Gabriel shook his head. “He’s a worm,” he said again, tonelessly. Will opened his mouth, and flushed faintly across his cheekbones. Tessa hid a smile. It had been weeks since Cecily had come to the Institute, and still her presence bothered and upset Will. He did not seem to know how to behave around this younger sister, who was not the child he remembered, and whose presence he insisted was unwelcome. And yet Tessa had seen him follow Cecily around a room with his eyes, with the same protective love in his gaze that he sometimes bent on Jem. Certainly the existence of demon pox, and how one acquired it, was the last thing he would want to explain to Cecily. “Nothing you need know about,” he muttered. Gabriel’s eyes went to Cecily, and his lips parted in surprise. Tessa could see him taking Cecily in. Will’s parents must both have been very beautiful, Tessa thought, for Cecily was as pretty as Will was handsome, and with the same gleaming black hair and startling dark blue eyes. Cecily gazed boldly back at him, her expression curious; she must have been wondering who this boy was, who seemed to so dislike her brother. “Notified who?” asked Jem, not unreasonably. He had moved closer to Tessa as the conversation had continued. As they stood side by side, the backs of their hands brushed. “The Clave. The postman. Us. Anyone,” said Will, shooting an irritated look at Gabriel, who was starting to get some color back and looked furious. “Lack of certification hardly proves intelligence,” Will muttered. “And you didn’t think to take any special notice of that?” said Will. “You don’t know our father,” said Gideon in the flat tone of voice he used sometimes when conversation about his family was inescapable. He turned back to his brother and put his hands on Gabriel’s shoulders, speaking quietly, in measured tones none of them could hear. Jem, beside Tessa, hooked his smallest finger through hers. It was a habitual affectionate gesture, one that Tessa had grown used to over the past months, enough that she sometimes put out her hand without thinking when he was standing by her. “Is that your wedding dress?” he asked under his breath. Gabriel looked surprised, and Tessa could hardly blame him. Gideon knew of Will’s curse, of the belief that had caused his hostility and his abrupt manners, as all in the Institute did, but the story was private to them, and none outside had been told of it. “I am conveniently already in gear,” said Will as Henry shucked off his coat and traded it for a gear jacket and a weapons belt; Jem did the same, and suddenly the entryway was full of motion—Charlotte speaking quietly to Henry, her hand hovering just above her stomach. Tessa looked away from the private moment and saw a dark head bent with a fair one. Jem was at Will’s side with his stele drawn, tracing a rune on the side of Will’s throat. Cecily looked at her brother and scowled. “I, too, am conveniently already in gear,” she announced. “You were doing the same at fifteen,” said Jem quietly, and Will spun back toward him. For a moment everyone seemed to hold their breath, even Gabriel. Jem’s gaze held Will’s, steadily, and not for the first time Tessa had the sense of unspoken words passing between them. “You are in your wedding dress,” Will protested. Will groaned something in Welsh—unintelligible, but clearly the tone of a man defeated. Across the room Jem cast Tessa a slight, worried smile. The Institute door swung open then, letting a blaze of autumn sunlight into the entryway. Cyril stood on the threshold, breathless. As you are doubtless aware, your term of service as Consul, after ten years, is coming to an end. The time has come to appoint a successor. As for ourselves, we are giving serious consideration to the appointment of Charlotte Branwell, née Fairchild. She has done good work as the head of the London Institute, and we believe her to have your stamp of approval, as she was appointed by you after the death of her father. As your opinion and esteem are to us of the highest value, we would appreciate any thoughts that you might have on the matter.